Well this guitar started life 20 years ago, as I had a guitar shop, and I kept selling guitars that I wanted to use. So I had this idea that if I knocked up a guitar, it would have no real sale value so not worth selling. So a mate was in and drew round a USA tele with a big permanent marker and said he would knock up a body and neck by next weekend. 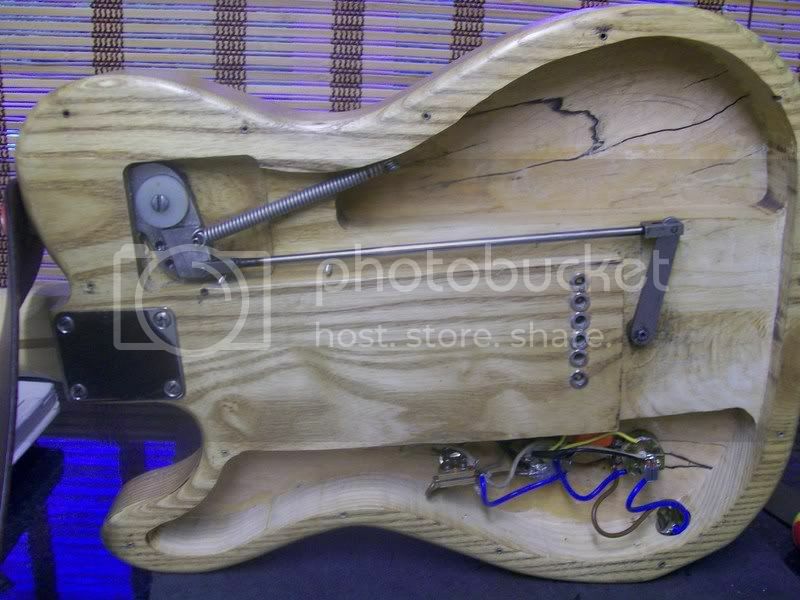 Well the body was made of Ash with a maple neck, and I had spare parts lying around so put it together, Bridge was a spare 6 saddle replacement which came with a 52 reissue, rest of stuff was just whatever was in including the top strap button from either an Aria ProII bass or an Ibanez, cant remember now. Neck was always a bit too thin so I bought a Mighty Mite maple neck, which for some strange reason I stuck a X files badge into headstock. As you do! The B bender was made by looking at a pic from the ultimate guitar book, and sort of copying it, cost me a pint or two and some crisps. Originally made it out of aluminium but after using it for a year or two, made a proper stainless steel version. I then had a mate offer to make me a body out of Ash and Spalted beech, so now I had a new neck and new body. around this time about 2006-2007 I was really struggling to play as my hands were cramping up with Arthritus, so my mate Keith Robbins of KSR guitars offered to make me a new neck which would be much thicker, my brief was if you lay it on table with no machine heads on I do not want to see any light come though, in other words from Heel to back of headstock one straight line. This much thicker neck did wonders for me, a lot less pain and cramps from playing as the larger diameters support the thumb area etc. So now I am on 3rd neck and 2nd body, after about 20 odd pickups I have stayed with a Voodoo Broadcaster style pickup which is approx. 10.5 k or so. neck pickups was never happy so eventually made it into a Esquire. Around this time, I also struggled with wiring using a standard LP toggle switch so ended up hacking stuff about and putting a fender blade style switch in. Then I stained it with a mixture of cooking oil, 3 in 1, Boot polish, and some Danish oil as well I think! and here is my review. As a guitar, I am very lucky it is resonant, and has definitely been improved tonally and sustain via latest neck. The body with such a lot of routing is light and easy to handle. The neck which everybody who tries it thinks is too big, but after using it for a while they all agree what a playable neck. Sounds? 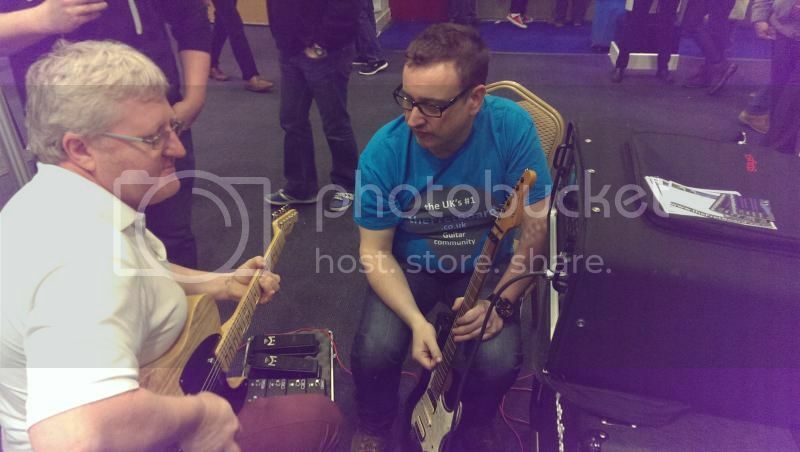 well the main thing for me was to get a standard tele tone, which is not thin, sharp clear and biting yes but not thin. I wired it with 50's style tone arrangement yet use a 500k for tone with a .02 as opposed to .05 cap. I find I do not use or like the treble bleed stuff, myself, but I needed extra sounds, so I have done a slight variation on the cocked wah/eldred mod, which although not a great clean sound when put with a TS style OD really screams LP Custom tone. I have used this guitar in HR bands, Cabaret, Country and in my RnB band and it just works. I could never put a value on it as its a bit of a pigs ear, but it would cost me a fortune to replace, and it will be my last main guitar. Hope you liked the story and can see why it has the name! Cool guitar - and one that's perfectly tailored to your needs, by the sound of things. A brilliant story, title and review ! 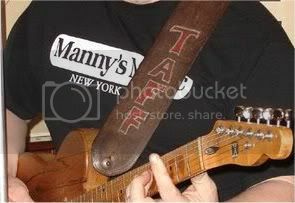 Taff, has it had 17 bodies and 14 necks. That's very cool indeed, love the homemade b bender. What is the back covered with, any pics? You didn't at the time though! Thought you would like to play a real vintage guitar! That's a superb post and a wonderful personal guitar. I've always wanted a B Bender, but as a left hander my chances of ever getting one are about as high as finding rocking horse droppings, so you've inspired me now. I'm going to look into putting one together for myself. Let me know if I can help in any way ok. I will do mate thanks. There's a book on the Fender Telecaster by Dave Hunter which has several close up shots of the back of Clarence White's original Tele, so that should be a good place to start. I only ever saw a small pic in the Ultimate guitar book by Paul Day and Tony Bacon! I think that's a simpler system as shown in that book. 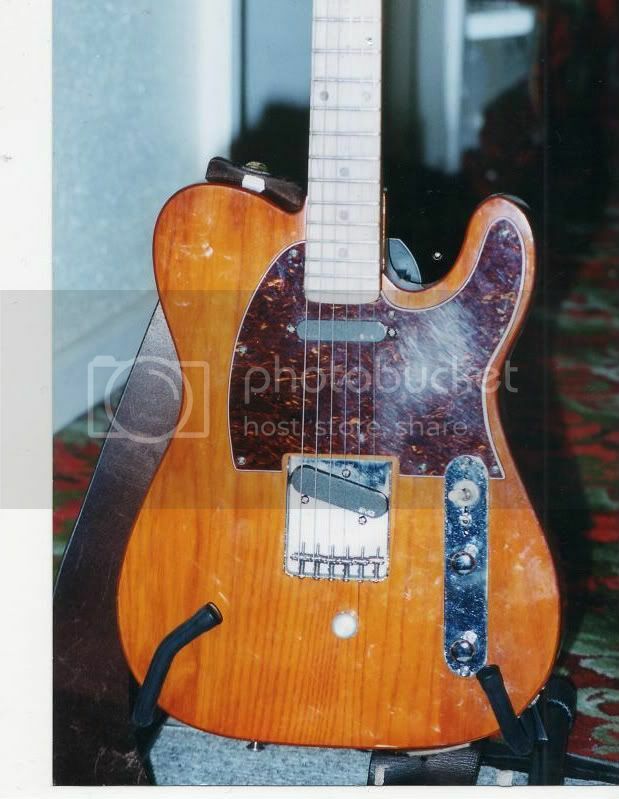 The Clarence White Tele is pictured as it was when he died, which looks to be either a different system or something revised and altered to help him bend more than just the b string. Either way that once in the Bacon book is worth having a go at.